Over the previous couple of months, Facebook has seen lots of ups and down not only in their ranking but also in its credibility. When Timeline was release, almost the whole audience boycotted the new enhancement. People were so annoyed that they invented different methods of removing timeline. However, as the time passes, people started to enjoy the new features of their Profile, particularly Timeline cover was something that literally amused everyone. There are tons of Covers available on the Internet, but when a person search on the internet regarding “Timeline Covers for Blogger” he hardly witness one or two covers and of low quality. Therefore, today our designers have shaped 5 high quality Timeline covers that will represent the personality of a blogger. 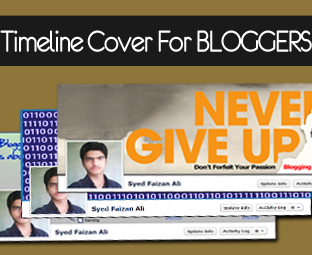 The follow 5 Timeline Covers represents 5 Different Kinds of Bloggers, How that Feel, and etc. Unlike, other Cover Resource we will describe the reason why you should apply it on your Facebook profile. This one is an elegant Cover because a webmaster can easily insert his personal information i.e. Name, URL, EMAIL and can even include social networks. It gives a touch of high class professionalism because it is built with 3D Vector ART. A person can easily reshape it and can even use it on his GOOGLE+ profiles. This one is especially design for those webmasters who love their Audience. In spite of making money from their site, they give more significance to their visitors. According to ME, “Blogging is not about Earning, it’s about serving the humanity”. The Cover below shows that a webmaster should take care of his visitors because without visitors a site will become a graveyard. Over and over again, we saw millions of people walking out the Blogosphere because they aren’t generating anything for their living. This Cover is put up for webmasters who is a Warrior. No matter whatever happens he will keep on fighting (Blogging) until he conquers the War (Blogosphere). This one is a Geeky Cover. It is for those webmasters who are extremely passionate about their site. It is pretentious and sleek. We have also added a Psd File, so you can edit the text according to your desire needs. Since, thorns and roses grow on the same tree. Similarly, there are lots of people who take blogging as a child’s play but when on writing their First POST they realize their blunder. Here, we have quoted “People Take Blogging So Easily but Later it becomes the biggest pain”. Hope these covers have fulfilled the expectations of our readers because without your appreciation and the 4 Blogging pillars MBL was not more than a piece or walnut. This is a small gift for all my Muslim and Non-Muslim readers who are anxiously waiting for the EID. Happy EID Mubarak to all our readers. Take a lot care of your family till then peace, blessings, and happy designing. nice collection... "blogging as a child’s play but when on writing their First POST they realize their blunder"... Damn True...!! I liked the first one. Nice collection Faizan. i think i am a combo of all the above. I like your "THE Blogger BIO Displayer" it is well informative..
i think they are working fine.. I like All Time line cover. but i love 1st One really Awesome. and thanks sharing PSD File. All the five covers are nice but i like the first one most. i like this covers, and i started to use one of this covers on my Blogger Page Account.